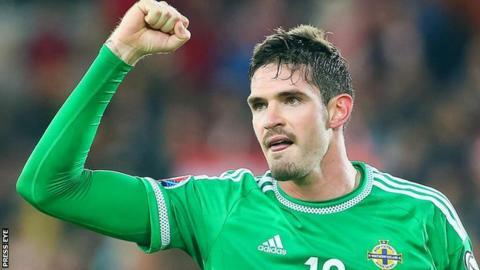 Northern Ireland captain Steven Davis has hailed Kyle Lafferty's "maturity" after he struck late to salvage a 1-1 draw against Hungary at Windsor Park. Lafferty has not played for Norwich this season but his injury-time equaliser moved his country to within two points of qualifying for Euro 2016. It took his tally of goals to seven in this qualifying campaign. "That's something that's been evident in this campaign, the change in him," said Davis. Lafferty picked up a booking for a late tackle which rules him out of the next qualifier at home to Greece on 8 October. "With the occasion, maybe a few years ago he [Lafferty] might have ended up getting sent off but he's shown a great maturity about him," Davis said. "He's put in a great shift for the team." Lafferty last played for the Canaries in January, having spent the latter part of last season on loan at Rizespor in Turkey, where he scored two league goals. While he remains out of favour at Carrow Road, he is an unstoppable force for Northern Ireland, who are chasing a first major tournament appearance in 30 years. "To play two games in the space of three days is not easy, but he kept plugging away and obviously was in the right place at the right time to get the equaliser," added Davis. Northern Ireland manager Michael O'Neill admitted he was tempted to substitute his star striker on Monday night, but he changed his mind when Richard Guzmics put the visitors in front after a dreadful handling error from Michael McGovern. "Kyle gives the squad belief," said Northern Ireland boss O'Neill, whose side remain top of Group F with two games to play. "We were taking him off at 0-0 but by the time we were ready to make the change it was 1-0 and it suddenly changed. "Kyle hasn't played a single minute of club football this season, or in pre-season, and he was really struggling. "We just felt he couldn't give us any more. But the thing about taking off Kyle is you're taking off your talisman. "If I'm the opposition manager I'm happy to see Kyle going off so we didn't want to give them that hope or satisfaction. "At 1-0 it was essential to keep him on the pitch. He treaded water for the last 20-25 minutes but he was there at the right time." Hungary need to win their two remaining matches to deny Northern Ireland a top-two finish, while one more victory - or two draws against Greece and Finland - will be enough for O'Neill's side.